Today at our spiritual hour I gave an introduction to the theme of judging (or not), and of the union between truth and love, after which a discussion followed. After I translate my talk into English and clean it up it a bit, I'll post it (or at least part of it) here. 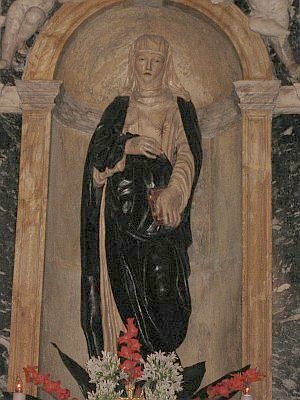 But for today, the feast of St. Catherine of Siena (in English occasionally spelled Sienna), a co-patroness of Europa (St. Benedict is the first patron), I'll just jot down some points about St. Catherine. I had remarked that the theme of not definitively judging/condemning while at the same time being ready to correct false behavior was illustrated by St. Catherine, who was quite bold even in her correction of the pope, and yet always showed respect for and obedience to him. In the discussion, in response to the question how we can reconcile the problem of avoiding negative judgments of other persons that are contrary to charity, with the necessity of making judgments in order to correct harmful situations, harmful and bad behavior, etc., a piece of advice from St. Catherine of Siena was pointed out. When we are affected by someone's bad behavior, before we set up seeking to correct it, we should mentally bear the consequences of that bad behavior, in the spirit of Christ, who bore the sins of the world. This identification and sympathy with the person enables one to approach them not as though an enemy, or condescendingly, as to someone beneath oneself, but as a friend in Christ, or one whom one loves that they might be a friend. This fundamental attitude provides a strong basis for making a judgment in the manner necessary, without condemning. Didn't you write out your talk in English to begin with? No, just in German. I don';t always do it that way, but in most cases I do. Also, I didn't originally plan to post it in English; that was an afterthought. I look very forward to the whole talk. This is a delicate, but important area, something with which we must deal almost all the time.